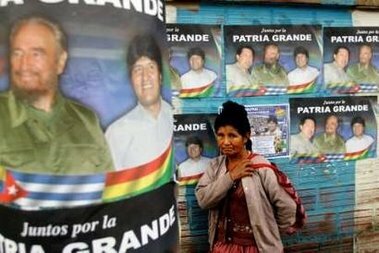 Bolivian voters did not buy the Castro, Chavez, Morales Alliance promises today in national parliamentary elections. President Evo Morales’ ambitious plans boost state control over the economy suffered a setback Sunday when his party failed to win control of an assembly that will rewrite the constitution, unofficial results showed. The results, based on a partial count of actual votes at 100 percent of polling stations done for the PAT television network, gave Morales supporters 132 seats in the 255-person body, far short of the two-thirds majority they needed to push through their leftist agenda. In a separate ballot question with potentially explosive results, voters in four of Bolivia’s nine states overwhelmingly chose greater political and economic autonomy for their states, according to the unofficial results. Each state voted independently on autonomy and was not affected by the outcome in other states. Sunday’s vote was a crucial test for Morales, an Aymara Indian elected in December on promises to wrest political control of South America’s poorest nation from a corrupt political class and more evenly distribute the nation’s wealth. He began by nationalizing the natural gas industry on May 1. A subdued Morales attempted to put the best face on the vote. Autonomy was a big winner in the prosperous Santa Cruz state. 100,000 residents of Santa Cruz showed up for a massive rally this week in support of autonomy. Today the people of Santa Cruz overwhelmingly chose greater political and economic autonomy for their states. Publius has more photos from the massive protest this week.